Not one, not two, but three goals were scored by the No. 9 Quinnipiac Bobcats men’s ice hockey team (12-2-0, 5-2-0 ECAC Hockey) on Friday at 7 p.m. to take the first game in a home-and-home series against the No. 19 Princeton Tigers (3-5-1, 3-3-1 ECAC Hockey) at People’s United Center by a score of 3-0. 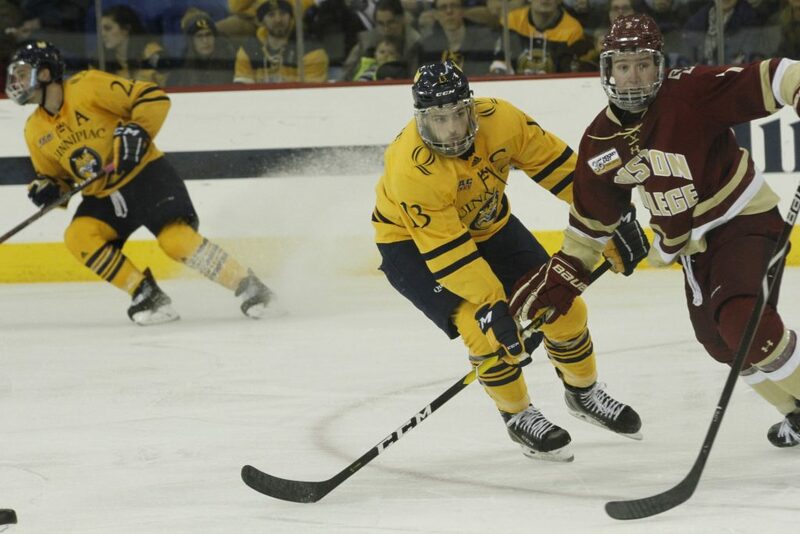 The Quinnipiac Bobcats came into Friday on a four-game winning streak and had just swept the Maine Black Bears in an away series as well. The Princeton Tigers came in after losing in heartbreaking fashion to the Massachusetts Minutemen 3-2 in overtime. The game started out very physically, with both defenses allowing very few chances around the net and not getting any goals right until the end of the first period. Then, with seven seconds left in the first, the Bobcats went on their first power play of the game. Off the faceoff win by sophomore forward Odeen Tufto, senior defenseman Chase Priskie fired a one timer past the Tigers goaltender Ryan Ferland to give the Bobcats a 1-0 four seconds until the buzzer sounded. It was Priskie’s ninth goal on the season. “Yes I think that’d be fair to say [that Chase Priskie is the number one option on the power play], “ said head coach Rand Pecknold. With all the defense being played, the goaltenders had to step up to not let their efforts go to waste. Both goalies, Ferland and Bobcats junior goaltender Andrew Shortridge, did great jobs in front of the net. Even in a losing effort, Ferland allowed only two goals on 33 shots while Shortridge kept a shutout with 21 shots on net for his second shutout of the year. At one point in the game, the Tigers were in their offensive zone and Shortridge blocked three shot attempts in a row to hold onto the lead. Speaking of Scott Davidson, he scored his first goal of the season to put the game away. Eight minutes into the third period, Davidson shot the puck which bounced off Ferland and into the net to give the Bobcat’s a 2-0 lead. “Unreal [to score my first goal],” said Davidson. “Snake bitten a little bit, lasted a little. Felt really good”. One of the other major factors in the game was the power play and penalty kills on both sides. Quinnipiac’s penalty kill held strong throughout the match, and even though the Bobcats took the most penalties with three, there were no goals allowed. On the other hand, Princeton had to defend off two Bobcat power play opportunities, allowing only the one aforementioned goal by Priskie to light the lamp when Quinnipiac had the man advantage. This goal swung momentum Quinnipiac’s way, where the one-goal lead helped Quinnipiac stay just enough ahead throughout the contest. The last goal was from Odeen Tufto near the end of the game with an open net for his tenth of the season. This would seal the deal, as the Bobcats won 3-0 and outshot the Tigers 34-21 on the night. Quinnipiac will now be heading to Princeton on Saturday to sweep the series and Princeton will try to even the series on home ice. Coach Pecknold believes there are a few adjustments that need to be made before the game. “Well right now we’ll take five minutes to enjoy the win,” said coach Pecknold. “Then we’ll start watching the tape. There’s definitely things we need to clean up. Things we need to clean up in between periods. There’s things we need to adapt”. The Quinnipiac Bobcats will face the Princeton Tigers at 7 p.m. on Saturday in Princeton, NJ at the Tigers home ice, Hobey Baker Rink.